Pentagon officials are reviewing the Unmanned Carrier Launched Airborne Surveillance and Strike Air Vehicle project to determine the aircraft’s core mission, Breaking Defense reported Tuesday. “UCLASS is one of our new starts, so we want to make sure we get the requirements right,” Frank Kendall, defense undersecretary for acquisition, told reporters Tuesday. “The deputy secretary’s asked to take a look at it before we let the request for proposals out, and we’re going to do that,” Kendall added, according to Breaking Defense. 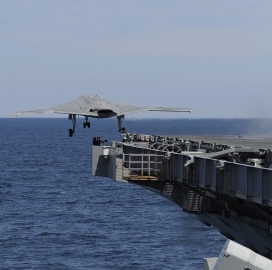 Sydney Freedberg writes the program raises the question of whether the Navy‘s future carrier-based drone will primarily have surveillance or bomber capabilities. 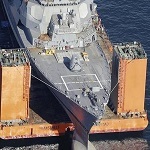 House Seapower Subcomittee Chairman Randy Forbes (R-Va.) sees UCLASS as a potential breakthrough for defending against “anti-access/area denial” threats, according to the publication. The Navy wants the unmanned aircraft to endure up to 14 flight mission hours as well as perform ISR and strike targeting missions from as far as 2,000 miles, Freedberg reports. “The intent is to provide an an affordable, adaptable multi-INT platform that supports missions ranging from permissive counter-terrorism operations, to missions in low-end contested environments, to providing enabling capabilities for high-end denied operations, as well as supporting organic Naval missions,” Mark Andress, Navy assistant deputy chief of operations for information dominance told Breaking Defense. Freedberg writes that a 1,000-pound internal bombload threshold is a minimum requirement for the UCLASS to enter service.